As I leaf through the artist’s book, Eclipse, another publication comes to mind. How to Enjoy Your Weeds, published in 1969 and written by Audrey Wynne Hatfield, is a quaint paperback field guide looking at how undervalued common plants have a range of practical uses: medicinal, culinary and horticultural. Very much of its time, the book describes the characteristics and benefits of each plant in enthusiastic detail. Edward Chell’s plant ‘portraits’ are like descendants to those black and white illustrations, and yet Eclipse reads like a field guide of an entirely different sort. Published by Stour Valley Arts to coincide with the exhibition at Beaney House of Art & Knowledge in Canterbury, Eclipse reproduces forty of the sixty exhibited paintings which reference Linnaean systems of classification and 18th century silhouette portraiture. It includes a text by historian and critic, Jenny Uglow, on the historical significance of the silhouette, in addition to an interview between the curator and the artist. Chell’s process of classification dissolves all identifying features of the wild plants he studies, leaving only filled out solid shapes. Set against what could be the glow of a distant horizon, the images are of forms that have been bled dry of the rampant colour normally associated with plant life. There’s none of the biting acid green of lichen-covered boughs or the giddiness of sunny orange nasturtiums. Even though the project studies woodland and roadside plants during the cycle of a year, the painted forms all look like dusky late season pods and stalks – plants literally reduced to shadows of their former selves. Rendered in silhouette, the specimens are captured like exhibits in a museum diorama. Yet it’s only a suggestion of a ‘true’ likeness. 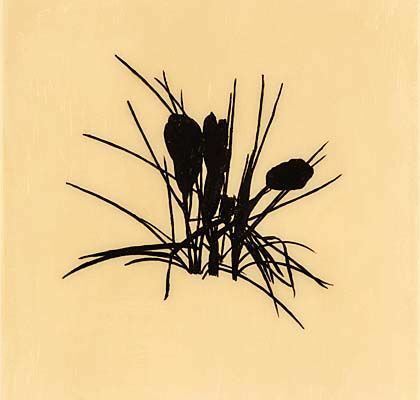 Clues to the plants original place or habitat are left to the imagination in the paintings – the initial sightings could have taken place at anytime and anywhere. While the convention of using black and white often functions as visual shorthand for the past, these silhouettes are not simply monochrome. The warm tone of the background behind the dark edge lends the muted subjects an other-worldly quality, creating a sentimental temporality in their seeming absence. Like Jenny Uglow’s essay on the silhouette, the interview between Edward Chell and curator, Dan Howard-Birt, is thorough, yet throws up many questions, namely those around uncultivated space or so-called ‘edgelands’. Chell describes these places, such as motorways, as those that “we touch but don’t necessarily feel”, and as transitional sites with which we have only limited engagement. Research undertaken for Eclipse in Kings Wood, a managed woodland space, might provide an alternative to this mode of attention, underpinned by a duty to conserve – a kind of meaningful engagement in itself. Eclipse is an affectively charged attempt to bridge the dislocation between these types of space or encounter, between the rigidity of cultivation and the romance of wild places. It seems plain that the childlike activities of flower pressing and painting should be worth a mention here, but this connection isn’t touched on at any point in the book. Howard-Birt notes that Chell’s plants appear as if sealed between layers of lacquer, like freshly pressed flowers. This observation refers obliquely to other journeys made further back in time, different to those that have evolved into this body of work. It follows the footprints of chaperoned strolls taken by 18th century ladies, to gather flowers for painting or pressing back at home. Once thought to encourage virtue in respectable women, this activity represented a brief, illicit affair with the wild before returning to the tame confines of the home. Art historically, flower painting has been a common genre for female artists and struggled to shake off an affliction of low cultural value, characterized as being petty and pretty, requiring only dexterity and dedication. 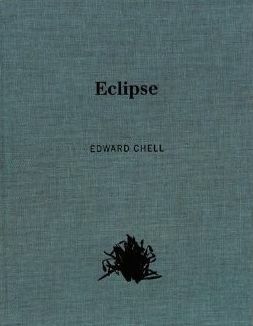 Initially, Eclipse developed not through walking but through the habit of driving, bound by the necessity of travelling, and this has been Chell’s primary mode for observation. An apparent sensitivity towards the boundaries and connections that affect both his subjects/ specimens and their habitats verges on the psychogeographical as well as the ecological. A scathing criticism of psychogeography has been that it is the hobbyist pursuit of the middle-aged man, infused with the pomposity of the self-styled flâneur. This isn’t of concern here. Another, more potent criticism would be that of a tendency towards nostalgia. Nostalgia is used to some degree as a moving or mobilizing affect in Eclipse to bring clarity to the subject. For instance, Chell speaks about the contradictions he feels are inherent within the processes of observation and conservation, as well as in the enjoyment and protection of habitat. Other parallels should also draw our attention. Just as in the classificatory practices of botany and natural history, definitive meanings are fleeting, fragile and always subject to change. Although strangely unacknowledged in the text, an intimate proximity to the natural world underlines the activities of the (male) psychogeographer and the (female) flower painter. Chell’s practice of ‘flower painting’, therefore, implicitly refers to a gendered cultural history of value, class and taste. This is the point at which Eclipse becomes more than merely a charming portal to a bygone age or a pleasing juxtaposition of 18th century aesthetics and ideals with current environmental concerns. When viewed against the joyful optimism of 1960s flower power or the aspirations of a self-sufficient suburban ‘Good Life’ in the 1970s, for example, the elegiac, mournful quality of Chell’s plant portraits feels rooted in the present day. As the resurgent interest in foraging, bee-keeping, and ‘growing your own’ sees these practices and ideas enter into a new cycle of interpretation and re-branding, it seems that modernity urges us to romanticize the symbolic purity of the natural world. What’s more, the desire to be closer to nature is complex and often contradictory. The expression of making such ‘natural’ lifestyle choices effectively displays a ‘good’ or ‘authentic’ moral self through a green consumerism which, conversely, so often relies on the privileges of land and vehicle ownership or private access. This is a far cry from the earthy, egalitarian ideals of learning how to enjoy your weeds. In contrast to this seductive image of equality and abundance, the ruined soil of common land is illuminated by Eclipse’s bleak nostalgia and dirty romanticism. The resilient presence of weeds breathes vitality into land flanking the roads and motorways, though it’s polluted with heavy metals and toxins, making it unhealthy and dangerous for human consumption. In the same desolate spots where these wild plants grow, other less wholesome scenes can be discerned. Breakdowns, the glare of fluorescent lighting, service stations, dogging, dumped waste and detritus can also be made out beyond the plants elegant silhouettes.